There are many variations of chicken curry in South Indian cuisine, but Chicken Curry with potatoes is possibly the most common in our household which I often make from scratch. 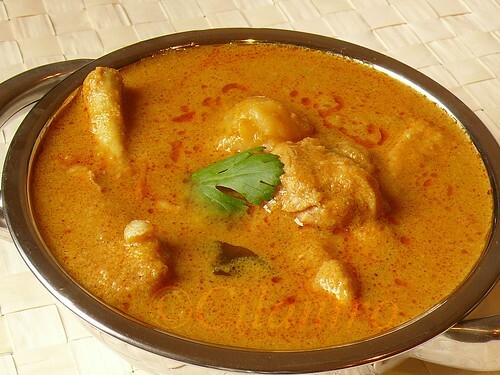 There are many Chicken Curry recipes which each adapts, and enhances it accordingly. The underlying flavors of this chicken curry is a mix of gentle South Indian spices which is gently roasted with coconut and cashews to give this curry a spicy, aromatic and remarkably scrumptious… There is no hard-and-fast rule to make this curry, use your favorite spices and add few tomatoes to make a delicious tasting Spicy Chicken Curry for a comforting Sunday`s meal. Clean and wash the chicken pieces and apply turmeric powder, salt and set aside. In a small kadai/pan heat a teaspoon of oil and add the coriander, pepper, cloves, cinnamon, fennel, cumin and finally coconut. Remove when the moisture from the coconut leaves. When cool, grind it to a fine paste with cashews. Set aside. In another pan, heat a teaspoon of oil and add the tomatoes and saute until the tomatoes are soft. Simmer for about 10 minutes or until the the tomatoes comes to a pickle consistency. In a heavy bottomed vessel, heat about 4 to 5 tablespoons of oil. Sauté the onions until soft, add ginger garlic paste and curry leaves. Sauté for few more minutes and add the marinated chicken, chilli powder and salt, sauté well until the chicken is no longer pink. Now add the tomatoes, potatoes and the ground masala and bring to a boil. Simmer for about 15 or 20 minutes and the oil separates. 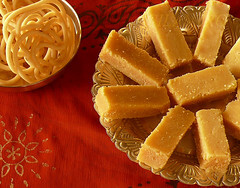 Serve with rice, roti or paratha. Goes well with Dosai too. I love when there is potaoes in a chicken curry and this just looks so so delicous. Love that gravy too. Yumm, am hungry now...gravy looks tempting and fabulous! Potato with chicken or mutton is very classy. The curry is very inviting! 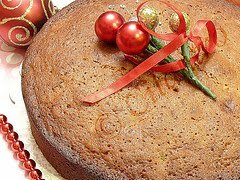 Ungal recipes ellamae super, parkkum podhae romba nalla irrukku. Photos super. Ennai pol beginers ikku romba useful ungal recipes. Diwali ikku ungal laddu recipe seithu elloraium asathitaen. Waiting for many more. Intha chicken recipe seithu parkiraen. Looks delicious Cilantro. The method you have used is slightly different from the way I usually make it. Will give this a try next time. Back home potatoes were never added to the chicken but they make a terrific combination. Lovely chicken recipe Cilantro..Always loved potatoes with chicken or mutton..will try this out for this weekend to go with idlis..and as always..your pictures are very clear and beautiful..keep up the good work..
Lovely variation which I will surely have to try! MMMMMMmmmm Declicous! That is one lip smacking finger licking chicken curry. In Bengal we add potatoes too to the chicken curry. Love this with rice. Hello, I have a question. I made this recipe but was confused at the end with the boiling. The ingredients that I had put together didn't include any water, curd, or coconut milk. Am I missing something? I ended up adding water, but I'm not sure if that's right. You are not missing anything, if you do find the gravy very thick then adding water is fine. The chicken I get here oozes out water while cooking and the coconut paste is enough to get a thick gravy. Let me know how yours turned out. I will try it again! I am having to use frozen coconut, which is probably much drier than fresh and my chicken wasn't as juicy. It was delicious even with the water added however! The best curry I have made so far and I've been trying for a long time to get one that tastes good to me. Thanks for posting it!